Plant growth can be limited by several factors, among which a lack of water is considered of major importance. Despite the vast knowledge of the effect of water stress on photosynthesis, there is much less known about its effect on respiration. Respiration, unlike photosynthesis, never halts, and it reflects the overall metabolism. However, the data available on the effect of water stress on respiration show large variation, from inhibition to stimulation under different water-stress conditions. 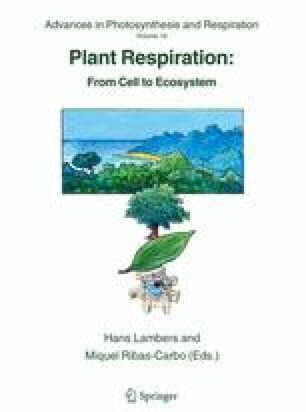 This chapter combines a review of the latest studies of the effect of water stress on plant respiration with the compilation of data from different authors and recent results to develop a working hypothesis to explain how respiration is regulated under water stress. Leaf respiration shows a biphasic response to Relative Water Content (RWC), decreasing in the initial stages of water stress (RWC > 60%), and increasing as RWC decreases below 50%. Under this hypothesis, the initial decrease in respiration would be related to the immediate inhibition of leaf growth and, consequently, the growth respiration component. The increase of respiration at lower RWC would relate to an increasing metabolism as the plant triggers acclimation mechanisms to resist water stress. These mechanisms would increase the maintenance component of respiration, and, as such, the overall respiration rate. This hypothesis aims to give a metabolic explanation for the observed results, and to raise questions that can direct future plant respiration experiments.